QTY 1234567891011121314151617181920212223242526272829303132333435363738394041424344454647484950515253 Please select a quantity. Looking for simplicity and country-chic flair? Look no further than this Handmade Rusty Industrial Shelf with Wood Planks! 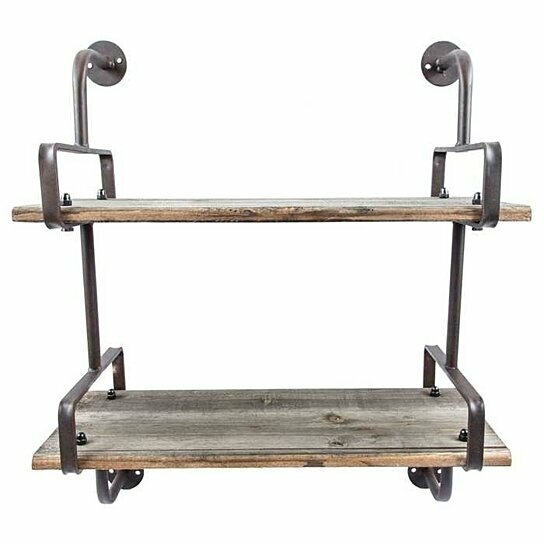 This undeniably charming shelf features rust-colored metal hardware and natural wooden plank shelves. Functional and lovely, this shelf is perfect for use in the bathroom to store toiletries, in the entryway as a catch-all for keys and mail, in the kitchen to store utensils, spices, or coffee, or in the living room to display figurines and treasured items! Shelf Length (Actual Display Space): 7"
Shelf Width (Actual Display Space): 14 3/4"